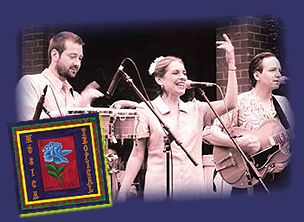 The musicians that make up Gardenia Azul are vocalist Kathy Elzey, guitarist Ray Elzey and percussionist Cary "Huesitos" Avery. These musicians have performed and recorded around Sacramento for many years with groups ranging from Red Rose, Caron Vikre and Los Elegantes to Bourgeois Tagg and Charlie Peacock. Cary has also performed with Cal Tjader, José Feliciano, Mumbo Gumbo and Escola Nova de Samba. Moises Rodriguez from "Trio Los Amigos" makes a special guest appearance on Gardenia Azuls CD.